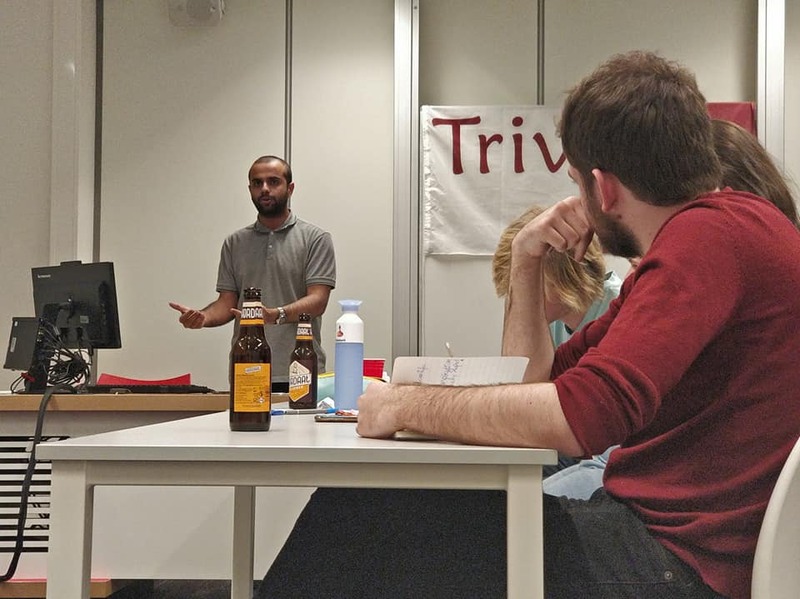 Yesterday evening, the Debatbond hosted the first Bondsraad of 2019. 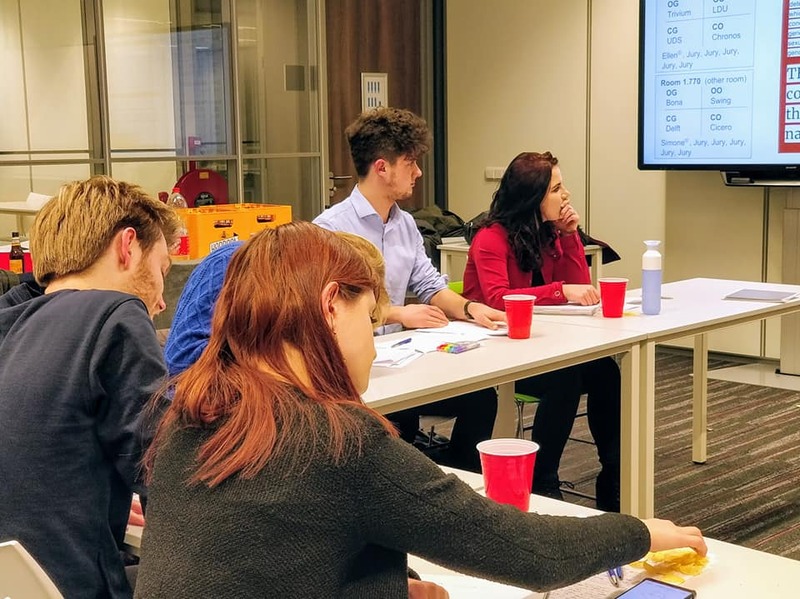 At our usual spot in the always sunny Utrecht, the Dutch debating societies came together to discuss our collective futures and make important decisions. After relocating twice on the UCU campus, and shoving the last kaassoufles down our throat – everybody was ready! To get everyone up to speed, 720 put together a quick post-Bondsraad brief. As always, the Bondsraad started with some general updates from the board members, explaining what they had been up to. Some of the bigger project will be discussed later separately, but apart from the usual tasks such as DDL, 720, finances, or managing the website- there were a few highlights. For instance, Ybo has been working on organising a Dino-tournament with retired debaters. On a Saturday in September, the precise date will be announced later, we will invite lots of alumni to remind them how fun debating used to be! Moreover, we briefly touched upon the board visits we have made in the last few months, travelling to every society in the Netherlands. Lastly, Linsey announced she is working on the next Board Day – taking place at the end of June! After the initial boring updates, we got right to the juicy part of the evening: voting on the motions put forward. The first motion we discussed was the instalment of the national equity officer, a role proposed by the Debatbond at the last Bondsraad. Unfortunately, the idea was to have a team of three equity officers and we have only received one application. Therefore, the Bondsraad decided to postpone the instalment to the next Bondsraad and keep searching for national equity officers in the meantime (send Ybo a message if interested). Second, we voted in Chronos as member of the Debatbond. Hurray! We are very confident that our favourite southerners will contribute a lot to the Dutch debating community for a long time. Subsequently, we discussed two motions tabled by Bonaparte. The first motion instructed the Debatbond to manage a central platform keeping track of all the information about Dutch debating tournaments. Everybody liked the idea and in the near future our website will be updated with all necessary information, finally giving you an excuse to delete Facebook! The second motion was slightly more controversial. Bonaparte wanted Linsey (who has been voted in as country representative at EUDC… again) to lobby for lower judge fees at EUDC and WUDC. The rationale behind the motion is that more people want to speak rather than judge, which makes finding judges quite hard and limits the amount of teams that can participate due to the N-1 rule. Other societies, however, did not agree with Bonaparte’s characterisation of judging, claiming judging is an experience in itself. Moreover, Linsey noted that getting support for this plan internationally would be very challenging. Ultimately, these and other reasons led to only Chronos siding with Amsterdam on this motion. After a four minute break, we moved on to discussions on various issues. First, we discussed the sponsoring plans drafted by Tom and Jelte. The idea to help individual societies more, as well as look for more funding as the Debatbond, was welcomed by the societies. We aim to bring you positive news on our next sponsor in the foreseeable future! Second, we discussed the decreasing participation in the DDL. After a lengthy discussion, we discussed on various changes: iron personing will be allowed in the DDL from now on, and will be implemented retroactively. Moreover, we will allow all societies to participate within the DDL from now on, and will be allocating team spots on a first-come-first-serve basis. Lastly, a committee will be formed in the summer to come up with solutions to improve the DDL competition, hopefully ensuring its future. Two more issues were discussed. Jos outlined his plans to improve the process to find a new board, which will need to happen this autumn. More information on this will follow later. Second, Ybo spoke about the GDPR and privacy. Basically, Ybo explained in ten minutes you can ask him for help if you need any guidance on privacy issues. That concluded our Bondsraad, and as true friends we all rode bus 8 to Central Station! See you at the next one. 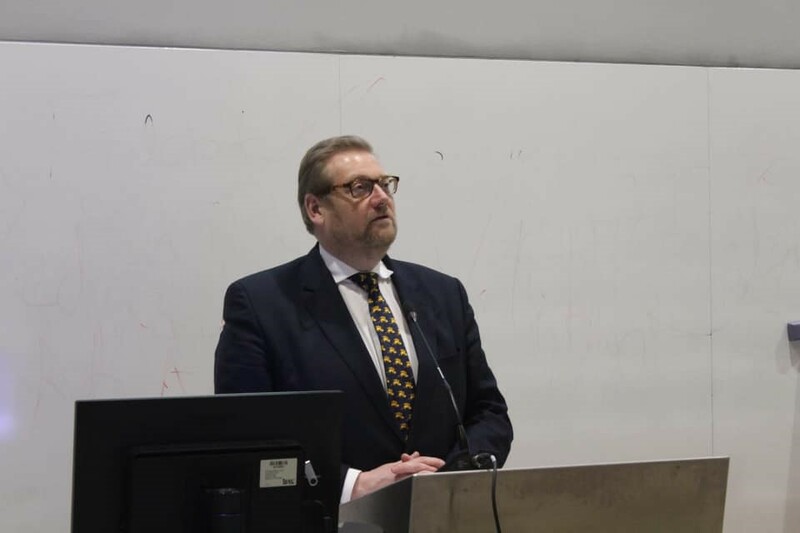 Pre-social drinks – former minister of justice Ard van der Steur opening the event – five excellent debates with lunch and dinner in between – epic social – headachy Sunday with great semi’s and a brilliant novice final – fantastic grand final – home in time for supper. LAST week was the Leiden Open. A wonderful tournament that, almost since its inception, has drawn teams from all around the world. This year debaters came from India, Pakistan and Canada, as well as Turkey, Serbia and the rest of Europe. This short article describes my favourite argument from this year’s Leiden Open. The argument was made in round three, on the motion: TH regrets the judicialization of politics. This debate centers around the question of whether activists, political parties or other groups should seek to change the law by going to court, or by lobbying, voting or otherwise persuading politicians to change the law. My debate was truly excellent and three of the four teams explained (among other things) whether change would happen faster, stay longer and be more meaningful if politicians, or if courts would be persuaded. Opening Government won this part of the debate by explaining that change will come through both ways, and even though change might be slower when it comes through a political change, it’s a better and longer lasting change, which is ultimately more worthwhile. One of the arguments I found most persuasive centred around the need for political and democratic buy-in after a specific law has passed. They explained that often a certain right is given by a court ruling, or by a political change, but that that right in and of itself is not very worthwhile. Examples given included the fight for civil rights, gay marriage and, best explored, abortion in the United States. They explained that the right of abortion, although immensely important, only truly becomes accessible when clinics are funded, available nearby, and when people are not forced to jump through all kinds of hoops to access their right. Furthermore, they explained the difference between how abortion became legal in the south of the US, and the equally religious Midwest. In the Midwest activists had a apparently lobbied immensely and therefore changed the hearts and minds of individual voters, which meant that abortion not only became legal, but was also supported by the population. Before these same activists had the chance to come to the southern states to persuade people there (or before they were successful there), Roe v. Wade had legalised abortion all throughout the United States. This meant that, even though people in the southern states now had access to abortion years earlier than they would otherwise have had, they were never convinced of its importance and value. Campaigns for legalising abortion slowed down, because backers were less willing to fund them and because activists thought that they had won completely. Unfortunately, that wasn’t entirely the case because of the roadblocks mentioned earlier: clinics in Alabama and the rest of the south are legal, but they’re still incredibly difficult to access. The conclusion seems simple: earlier access is fantastic, but longer change can only be gotten when change happens through politics, not the judiciary, and therefore we should regret the judicialization of politics. This line of argumentation, coupled with arguments about the politicization of the judiciary convinced the judging panel that the Opening Government had won the debate about which side would get more meaningful change. Yet, the Opening Government only placed second overall. I mentioned that three teams had debated about this issue, the fourth team (closing Government) didn’t engage in the debate about whether or not meaningful change would happen faster or slower, better or worse, through the judiciary or parliament. Instead, they posited that we don’t know whether change is good or not. That good changes (such as the examples mentioned above) could very well happen by going through parliament or via the judiciary, but that bad changes were equally likely. To bring this point home they gave examples of the Trump presidency and recent court ruling about migration, abortion and voting rights. Their position was that we don’t know whether change is good or bad, and that therefore the discussion about where that change is faster or longer-lasting is relatively useless. Instead it’s important to know what route to change is the one who safeguards the democratic rights of citizens in the best possible way. They then explained why citizens had these democratic rights, and why going through the judiciary was a violation of those democratic rights. They didn’t go so far as to say that this is an absolute right, or that democratic rights could never be violated, but they did win the debate by explaining that change itself isn’t good, and that having a more principally legitimate process of getting that change is then much more important. This is, I think, my favourite argument from the Leiden Open, edging out the fantastic Opening Opposition material from the Grand finals and a great Opposition case in round five concerning the need for self-actualization. I think it shows how, when you make an argument really well, a principled argument can win from even the best made practical cases. Obviously, this can be done in many different ways, but here the simplicity of explaining the redundancy of practicalities and therefore the importance of principled rights worked extraordinarily well. After round three I saw some great other debates, and if I would’ve been able to give speaks for the finals, it would’ve been even higher than the 85 we gave to the maker of this argument, but this is the one argument I’ve kept thinking about this last week, and I hope you’ll find it as interesting as I did. 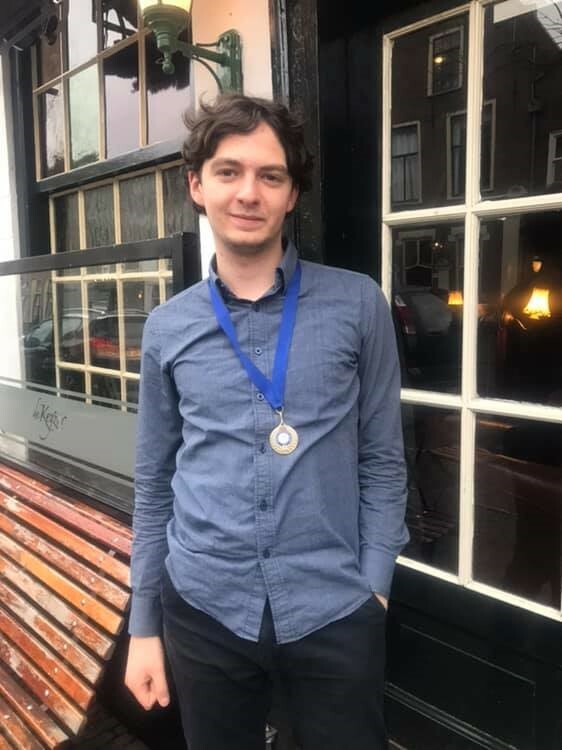 The Leiden Open was won by NYAUD (Novice finals) and Oxford Traitors A (grand finals), the best speakers were Rifka Roos (Novice) and Tin Puljic (open). I have loved the DDL’s concept from the start. I quickly dismissed some concerns that people had with sending new debaters to the DDL because it was deemed to be a competition between the best people of each society. Sure enough, this was the initial thought behind it, but more and more societies have become comfortable with sending new debaters to the DDL. I just love this. Also at this edition of the DDL in Nijmegen (the fourth one of this academic year already and the twelfth one overall), I met with debaters who were not necessarily veterans but who certainly proved their worth. Let me tell you more about this clash of (young and old) titans. Now, on to the DDL. 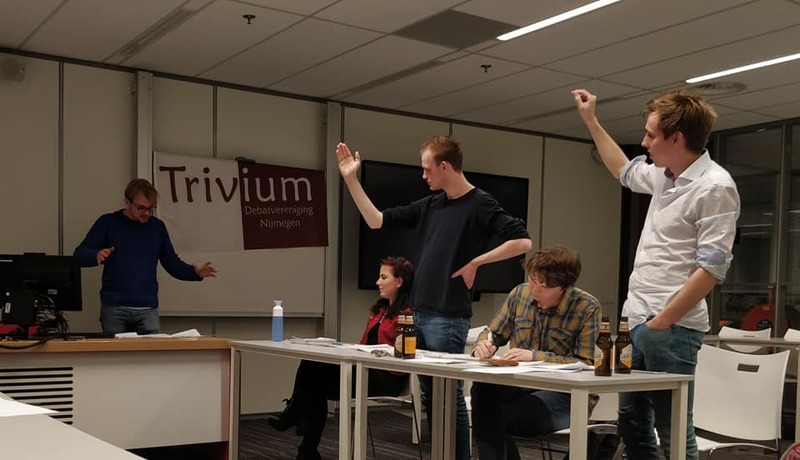 Very quickly for those of you that are unfamiliar with the concept, the DDL pits eight debating societies (namely Bonaparte, Cicero, Delft, EDS, GDS, LDU, Trivium, and UDS) in the Netherlands against each other in 16 debating rounds spread over eight evenings. These eight evenings are each hosted by the eight societies. Simple arithmetic then shows that each evening consists of two debating rounds. At the end of the season, the society with the most points claims the cup for the year and can call themselves the best society of the Netherlands for a year. This edition, Chronos (the debating society from Eindhoven) replaced GDS due to GDS, unfortunately, has been unable to send teams this season and it seemed fair to then allow Chronos as a replacement. Currently, the Debatbond is looking into the possibility to let Chronos enter the DDL in lieu of GDS permanently. Despite this being very sad for our friends from Kalliope, it did mean that we could meet with two members of Chronos: Leon and Inaki. Coincidentally, I actually met up with them at the train station after already having met up with Noémie and Alex from Cicero, my other lovely society. It turns out that Inaki is actually from Gran Canaria, one of my favourite holiday destinations. Anyway, let us talk about the actual debating that took place this evening. This house supports Western military aid to Juan Guaidó, the opposition leader and self-proclaimed interim president of Venezuela. um (Mara and Thomas) in OO, and UDS (Daan and Harmen) in CG. All kinds of different aspects were considered by the debaters. Of course, as one would, even China and Russia were brought into the debate. CG discussed how building enclaves would be part of the plan as well and how that can provide security for people in Venezuela. We tried to do something else. We explained how the people in Venezuela genuinely have an anti-Western thought process due to the prevalence of Hugo Chavèz in the past and his spiritual successor in Maduro, which consequently allowed us to explain how tensions grew and what other nasty effects are of interfering (actively) in Venezuela. In the end, we took a first, with Cicero taking a second, UDS taking a third, and Trivium taking the fourth place. This house, as the LGBTQIA+ community, regrets the “born this way” narrative. That was the end of the evening. I loved coming to Nijmegen and seeing some familiar but also new faces. I would recommend everyone to attend at least one DDL meeting, be it as a judge, speaker, or supporter! I vividly remember Bonaparte bringing supporters last year that even made up songs and yells to support their team. That is what I call dedication. I hop e that you will be able to attend the next DDL, which will be on March 18 in the beautiful city of Rotterdam! Over the Christmas Holidays, the World Universities Debating Championships took place in Cape Town, South Africa. The results have already been posted on facebook and the tournament ended over a week ago, but nevertheless there are my experie nces as a participant of WUDC. 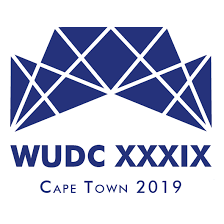 This WUDC took, as said, place in Cape Town. This definitely had some benefits for the tournament, one of them being the relaxed venue and accommodation. 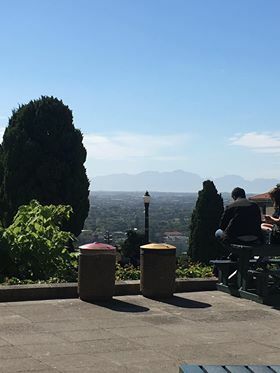 All participants stayed at the campus of the Univerisity of Cape Town, which had a lot of green scenery to relax in, as well as an amazing view from the main debate venue over the city. With all the surrounding beauty, it almost was a shame to go inside and debate. The actual rounds of debating started on the 29th of December. People definitely were nervous before the first round was announced, but nevertheless all Dutch people were in for judging and participating in some good debates. The results of the inrounds were mixed, with teams sometimes doing better than expected and sometimes doing worse. After 9 rounds of debating, all teams and judges definitely had some chances of break night, so on new years eve, we were in for a nervewrecking evening. Luckily there was free Yakka to help us get rid of the nerves, and the break was already announced around 23.00. Eventually, David and Marike broke open and Daan and Linsey broke as judges. A great result for the Dutch Delegation. After a day for recovery on New Years’ day, the outrounds started on January 2nd. David and Marike got through a Partial Double Octo, but unfortunately got kicked out in the Octo finales. Gigi and her partner Tommy from Oxford made it through the Octo’s but got kicked out in Quarters. This meant that there were no Dutch teams participating anymore when it came to the last day of the tournament. Finals’ day took place in CTICC, a big conference centre in Cape Town. From the high way it already showed that WUDC would take place there and everyone was all dressed up and excited for the finals. Now up until the open final, the whole tournament ran smoothly in the eyes of many particpants, but right before the open final was about to start African participants entered the stage while singing and dancing. They declared that they were done with structural racism in debating and were not going to leave the room until they had gotten apologies from different teams within the organisation. In this article I do not want to go into the discussion these actions caused, or my opinion about this, but I will describe how the event ended because of this. When the protest was going on, o ther participants were led into the dinner hall, where we got food as soon as it became clear that the finale was not going to start soon. In the meanwhile, the protesters were negotiating with the organisation about resolving the issue at hand. This took a couple of hours and a lot of stories and gossip surrounding the event spread. Eventually, the organising committee and tab team apologized to the protesters and the protest ended. During the protest however, the open final, judged by Daan (! ), had already taken place. Given the situation the organisation also felt it was not the best idea to hold a closing ceremony, which meant that everyone just went there own way. Most of the Dutch participants went into the city center to drink cocktails and recover from the evening. Eventually, after midnight, the results of all finals and speaker scores were posted on Facebook. We found out that Gigi had become best ESL-speaker in the world, an amazing achievement! And just as impressive was Marike becoming 7th best speaker in the ESL category. The results of the tournament therefore were great, but to me, the ending in this way felt quite surreal. Nevertheless, we can look back at a good tournament with great results and great achievements from all teams and judges. De afgelopen dagen vond het WK Debatteren voor studenten plaats. 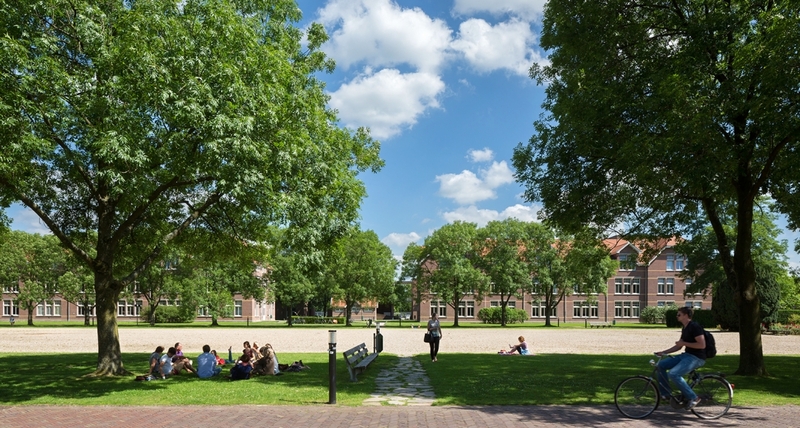 Het WK debatteren is één van de grootste jaarlijkse studentenevenementen ter wereld, waaraan ruim 400 teams meedoen van universiteiten uit meer dan 90 landen. Dit jaar vond het WK plaats in Kaapstad, in Zuid-Afrika. Nederland was vertegenwoordigd door twee teams (Leiden: Marike Breed en David Metz; Amsterdam: Zeno Glastra van Loon en Lana Moss) en drie juryleden (Linsey Keur, Daan Welling en Fabienne Ellemeet). Daarnaast deed de Nederlandse Gigi Gil mee namens Oxford University. De Nederlanders hebben het uitstekend gedaan. Leiden is als derde Nederlandse team ooit gebroken in de Open categorie en standde pas in de 1/8 finales. Daan en Linsey mochten beide verschillende finales jureren. Tot slot werd Gigi Gil uitgeroepen tot beste spreker met Engels als tweede taal! Een fantastische prestatie! De Debatbond is trots op de deelnemers, die het Nederlandse wedstrijddebat uitstekend hebben vertegenwoordigd.